We just returned home from a two-week visit in Alabama. It was great to be back and visit with family. While planning for the trip, two-weeks seems like such a long time--but once the trip starts our time goes by so quickly! We managed to fit in: a weekend at my family’s lake house, a family reunion, a 1st birthday party, several trips to a couple of home improvement stores in preparation for when we move home in just a few months, and many visits with family and friends. Overall it was a wonderful trip and it made us even more excited to get back home. 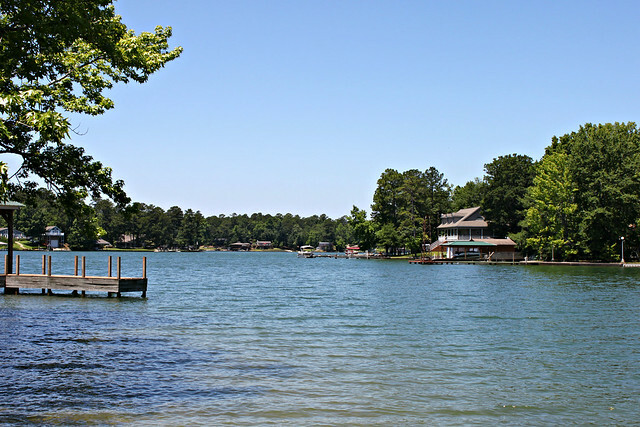 Picture taken by Russell out on the pier of my family’s lake house. Just before we left I roasted some tomatoes and they were wonderful. 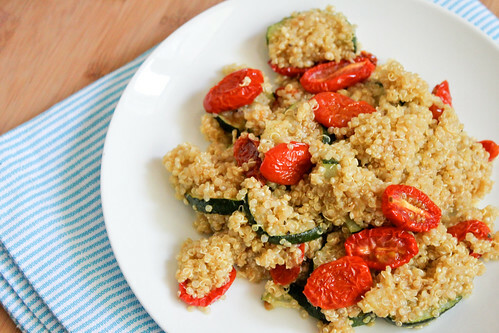 I had to find another way to use them, other than snacking on them, so I roasted a zucchini then tossed it with quinoa and some of the roasted tomatoes. It still needed something else so I tried a balsamic dressing that tied all of the flavors together perfectly. This made the best lunch for a few days and Jake even loved it! While on our trip I could not stop thinking about those roasted tomatoes, and although we just got back a couple of days ago, I have already roasted more tomatoes in preparation to make this recipe again! Preheat oven to 400 degrees F. Line a baking sheet with parchment paper. Place slice zucchini on baking sheet and drizzle with olive oil. Sprinkle with salt and pepper. Roast for 10-15 minutes. In a small saucepan place uncooked quinoa and chicken broth. Bring to a boil. Once boiling, cover and reduce to a simmer. Simmer for approximately 15 minutes. Remove from heat and allow to sit with the lid still on for 5 minutes. While the quinoa is cooking, in a small bowl combine the balsamic vinegar, olive oil, dijon mustard, and sugar. Set aside. 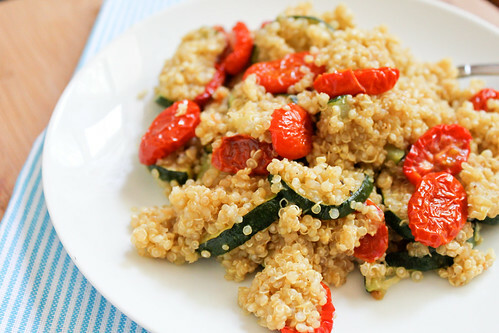 Once quinoa and zucchini are done, place them in a medium sized bowl. Stir in roasted tomatoes. Drizzle dressing over quinoa and toss to combine. Serve warm.